Library’s Namesake, Katharine Brush, Made it to the Banned List! Did you know that our library’s namesake, Katharine Brush, wrote a book that was once banned from a town in Massachusetts? It’s true! 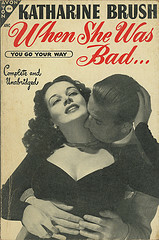 The 1949 reprint of You Go Your Way, also known as When She Was Bad, was banned that same year in Pittsfield, Massachusetts, for having an obscene cover! Bookstores and newsstands were asked to remove the book from their shelves (along with several others). Katharine halfheartedly apologized for the cover photo, saying she should have chosen a more tasteful picture but simultaneously compared her book cover with images seen in advertising at that time. For more information about this story and a few others on Katharine Brush, check out the “Kay and Me” blog at the following website: http://kayandme.blogspot.com/.